If your baby is of average weight & height (or above), chances are he’s about to outgrow his infant car seat (if he hasn’t already). It’s about time for a convertible car seat. —>Skip ahead to the best convertible car seats. A convertible seat is called so because it starts out rear facing, usually for babies from 0-24 months (preferably longer), then converts to a forward facing seat for 2 to 4 or even 5-year-olds. There are also “all-in-one” seats, such as the Evenflo Symphony, the Graco Milestone and the Graco 4Ever. These seats can be used rear-facing, forward-facing, or as a BPB (belt-positioning booster seat). “Hell, why doesn’t everyone just buy an all-in-one seat?” you ask. Well, because most of them are not tall enough for bigger kids who still need to be in a booster. Translation: You would still have to purchase another/taller booster seat anyway. Compared to infant seats, convertible seats are monstrously big — they look like giant baby thrones. With a few exceptions, they are also quite heavy (20+ lbs). Unlike with infant seats, weight is not as big of a deal because you’re not going to be taking it in and out of your car every day and plopping it into a stroller. The recent trend is to keep children in a harnessed seat (a convertible seat, as opposed to a booster seat) for as long as possible – simply because it’s safer. You see, ten years ago, most convertible seats were rated only up to 40 lbs or so; in the last few years, they’ve become much taller and rated for higher weight so that young kids can stay harnessed longer. This is a good thing because the vast majority of parents have been putting their kids in booster seats far too early. Nowadays, you’ll see many seats going up to 70 or even 80 lbs. Just remember, though, that a child will almost always outgrow a seat height-wise before they hit the max weight. An 80-lb seat is… let’s just say I’d be shocked to see an 11-year-old (~80 lb) child riding around in a convertible car seat… gimme a break. So, unless you have a special needs child or your kid is super heavy, you’re never going to hit the upper weight limit – and if you do, your seat will have expired anyway! Hence, a 50-60 lb seat should be sufficient for the vast majority of the population. 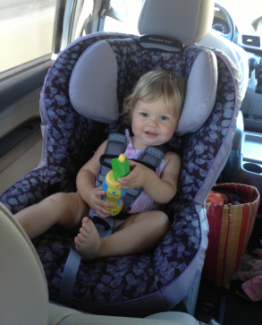 —>Read the full Convertible Car Seat Guide.